I have a pet peeve and it’s torn cereal boxes. Mr P, among most of the men in my family i.e my brothers while growing up, seem to never be able to open a cereal box without tearing the lid in half or sidways. It’s a small petty pet peeve but one that I can’t live with. Call me OCD but it looks horrible and makes the cereal go stale. Who wants to eat stale cereal? Not me. I have owned a few various food storage containers for my cereals over the years. They are the perfect solution to this annoying pet peeve of mine. However, it created a new pet peeve. Most of the containers I have owned hard hard to open to clean out and refill. They also are too hard for the kids to open and pour themselves a bowl of cereal. While this was never a problem in the past Buba is now on “independent mode” and at an age where he wants to do things himself. He found the last ones we owned very hard to open and handle. 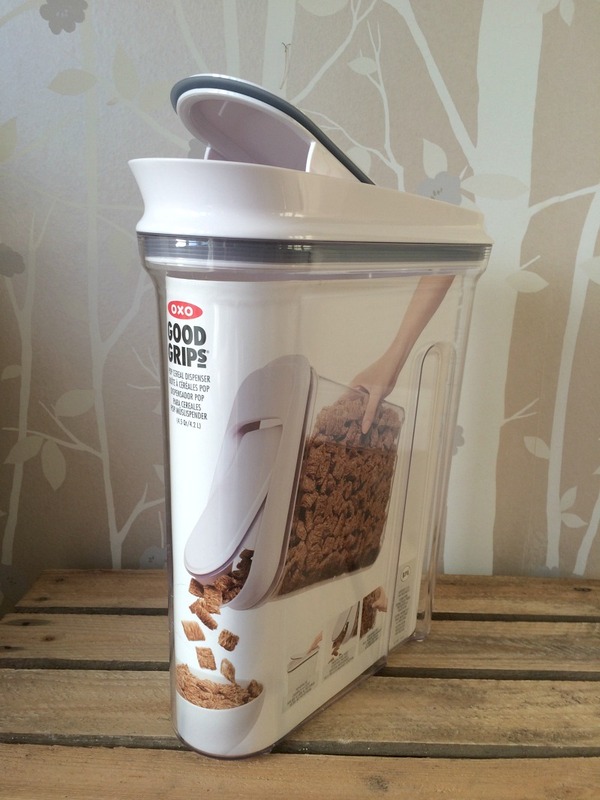 In comes Oxo Good Grips with their amazing POP Cereal Dispenser. 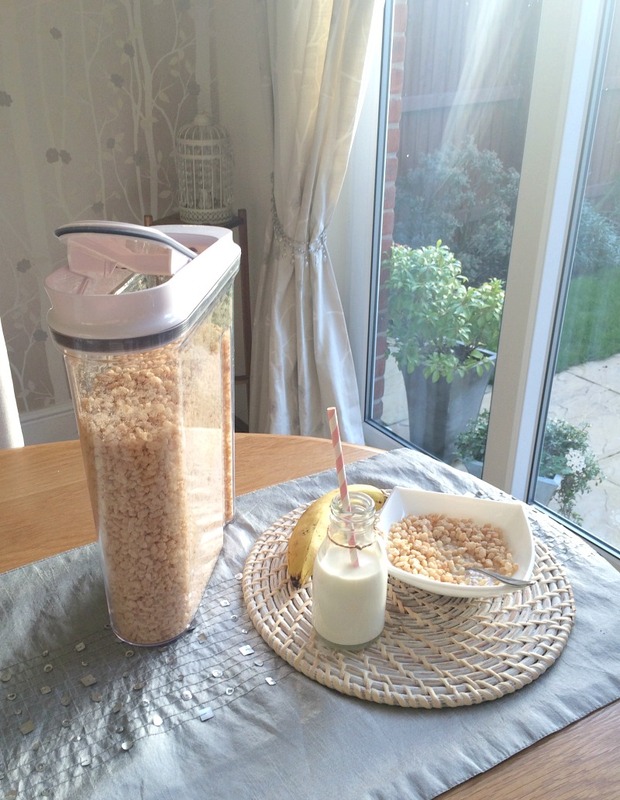 If you are a frequent reader here you will know I am obsessed with the Oxo range both Oxo Tot and Oxo Good Grips. They make my love for being in the kitchen so much easier with their amazing helpful gadgets and tools, not to mention their stylishly hip, Oxo Tots range for kids. I was a little worry that this 4.2 liter cereal dispenser might be heavy or too big for Buba to handle but I was so wrong. It’s very light weight, almost feather like, I promise. I never lie in my honest reviews. One side has contoured grip for easier holding especially for those little hands. The lid literally pops open at the slightest touch, even Missy Moo can do it. Now for me it’s about the cleaning and refilling as well. Some cereal dispensers are so hard to take the entire lid off to wash out. I have tucked and pulled on many that end up popping me in the mouth when it’s finally released. You know what I am talking about if you use cereal dispensers. Not a good moment trying not to curse in front of the children. This lid has a rubber liner so it suctions open and close making it easy to remove. Impressive Oxo you have done it again. I am with you on the cereal boxes, my kids are always ripping and then letting the ceral pour down into the box! How much did it fit in? I always think it wouldn’t hold enough and then I would be left with a box at the back of the cuboard. Oh no i really shoukd have mentioned that too. I hate that. This held the entire contents of the super size tice krispy boxes. None left over!!! Oh that does look good! I’m a recent convert to OXO (thank you 🙂 !) and now I want to try everything! We don’t eat cereal but it looks like it might work quite nicely on porridge too! Oh yes convert to oxo and oats woukd be great too in them. Or even rice!!! Thanks hunny. I had those but never fit it all in. Always can count on ikea though. I love the oxo ranges too. Everything is always so well designed. Quick (slightly random) question. How wide are the boxes? I have boxes for my cereal at home but they’re a bit to wide for the cupboard I keep them in so don’t fit nicely. If these are the right width I’ll definitely be thinking about getting some. I’ve heard lots about the Oxo storage range but have ever seen them in person but they look fab. I do get excited about food storage so it might be worthwhile my looking these up for my own kitchen. Thank you Nikki. I am SO glad I am not the only one. I love anything storage! lol Oxo range in all their kitchen stuff is just heavenly! I’m so with you on the cereal box thing – esp when they try and do it themselves and they can’t control the box and all of the rice krispies just come flooding out! 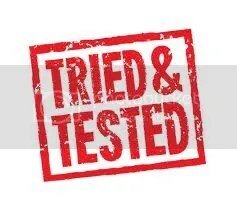 I haven’t come across the OXO range before, but this year is about being organised so I’ll go and check it out. Thank you! Thanks Tracey. Yes I am a huge fan of oxo i am constantly mentioning their products on my recipes too. So impressed with their quality worth the price. Argh I NEED these! 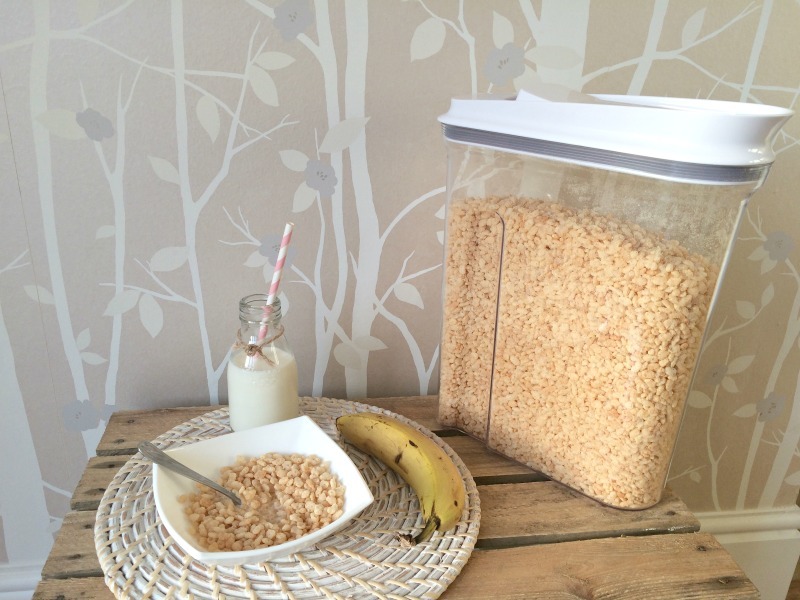 I’ve been looking for some decent cereal dispensers for a while but everything seemed to have lids that had to be removed which was just asking for a cereal disaster to my mind. I’m off to order some now! It is really nice! I would love to have one! Thanks for sharing!